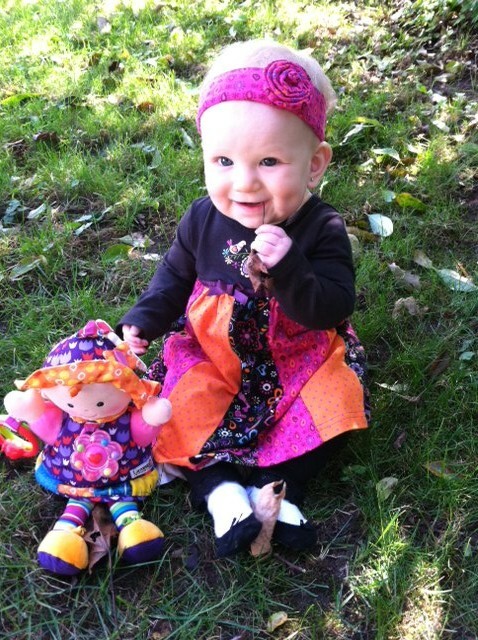 And now, today, our little Maya hit the nine month mark. She’s been out of the womb as long as she has been in and, frankly, that milestone is mind-blowing to me. It hasn’t felt like it’s been nine months … yet at the same time, it’s hard to remember life before her; it feels like we have known her forever — and we have a lifetime ahead. She’s curious about the world around her, wanting very much to be a part of it. She’s taken to sharing her toys and food with us, grabs at anything we are eating/drinking/playing with. She gets very transfixed on things (much like her engineer daddy who can’t stop once he has started something) and you can just see her wheels turning when she is playing with a toy and figuring out how it works. In terms of mobility, she can stand supported up against the couch and though she can’t really crawl yet, she is rocking on her knees and scoots backward to get around — which is quite hilarious! And she is a consistent eater and napper (which I know could change at any time) — two things for which we are extremely grateful — and is a rockstar traveler to boot! She hasn’t gotten to the stranger anxiety stage yet – and she also doesn’t cry yet if she doesn’t get her way … but we know those days are ahead and will do our best to be prepared for them! This 6-to-9 month period has been, by far, the most fun yet — she’s getting a personality and it’s incredible to watch her live in her world. Today, I literally sat and just watched her in her jumperoo, talking to herself and playing with all the toys on it as she bounced like crazy and turned to flash a grin every so often, like, “See mama, I am having so much fun doing the simplest thing!” I wish I could just bottle her joy right now and protect her from everything unjoyful in the world. I know I say it all the time, but I feel truly blessed. Today was my last day of pumping (2 pumps) and now I’m done, officially, with the breastfeeding portion of Maya’s childhood. I have known this day was coming for a long time and though the past month she really hasn’t gotten much from me, I know I’ve given it–and her–my all. I know I could try to go longer, but I’m not going to. I’m ready to put that bag away tonight (after I wash the dozen parts!) and retire it til our next baby comes around. It’s bittersweet; I was picturing trying to feed her tonight before bed, but tonight didn’t exactly work out for that … yet it was an amazing night in spite of this. I was Skyping with my sister while I gave Maya (who is under the weather and was very overtired due to an “off” nap schedule today) a bottle and she basically did a dream-feed. She fell asleep in my arms and after we hung up, I just sat there in the rocker with Maya snuggled in my arms, listening to her rhythmic breathing and thanking God for moments like these. I dreaded having to burp her, for fear of waking her, but if she isn’t burped, she will spit up in her sleep …. so I did the careful swoop maneuver to get her onto my right shoulder and, just like when she was an infant, she nuzzled into the crook of my neck, her sweet breath warming my neck, and stayed there. I completely expected her to throw her head back and open her eyes and smile wide and chat with me … but she stayed exactly in that spot. After a few minutes, I decided to put her back in the crib. She rolled right to her left side, curled up in the fetal position with her glowing seahorse, and snuggled under her blankies — well into her own version of dreamland. A kiss on the forehead and I was out the door. It was then that I realized I didn’t get to breastfeed her that one last time … which means the last time I nursed her was Friday, for just a few minutes. But you know what? I wouldn’t trade one last breastfeeding session for tonight’s night-night experience. Happy nine months, our baby-blued sweetheart! Next postHow to Bid Adieu to (the Paci Part of) Giraffe?? Sounds like a perfect bedtime for you BOTH. I hope this confirms for you that the right decision was made. Here’s to another nine months my wonderful mommy friend! Happy nine months sweet papaya! So, so happy to be on this journey with you. You’ve become an inspiration for me should I ever get fortunate enough to have another child (your post isn’t helping by the way! :)). I’m super proud of you for sticking with it but moreso I’m really happy to see how well motherhood suits you. Maya is one lucky little girl. Lis, this is so beautiful/ I hope that you save it and read it to her one night when she is older. You are an amazing mommy!